Heidelberg castle (Schloss Heidelberg) is one of the many things to see and do in the city of Heidelberg in Germany. A perfect city to spend a weekend, easy to walk through and explore all its experiences. 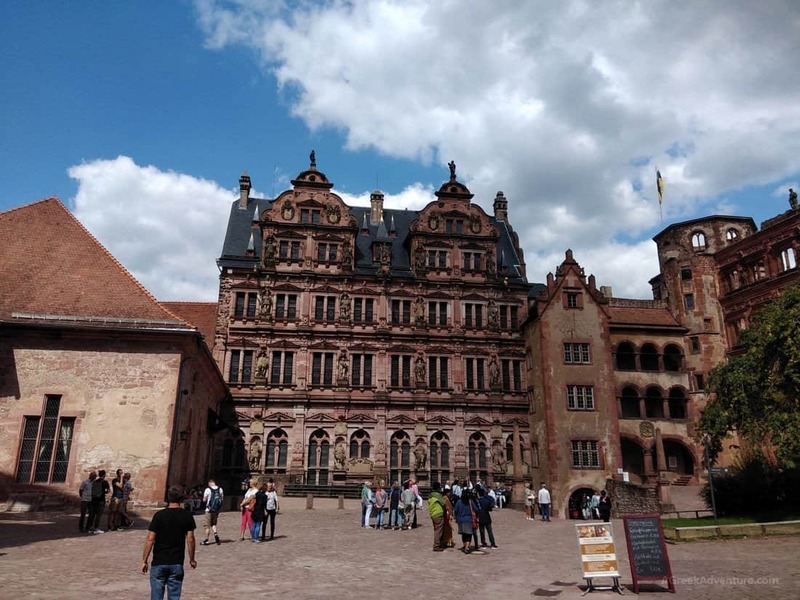 We planned a weekend in Heidelberg, being very curious of its castle, the old city center, the University of Heidelberg and… the philosophers path(!). We found more than these in this beautiful and well organized city. Here are our experiences in Heidelberg. 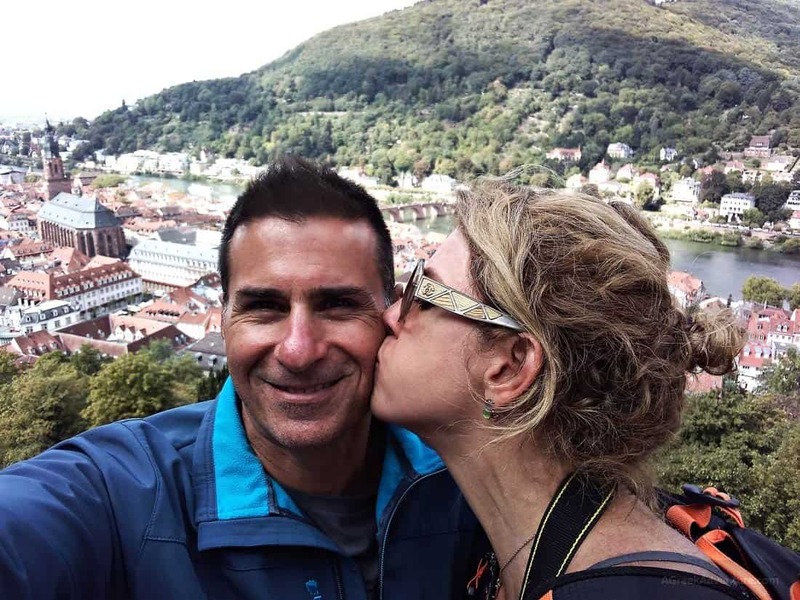 What are the Things to Do in Heidelberg Germany? How to get to Heidelberg, Germany? Two days are enough. 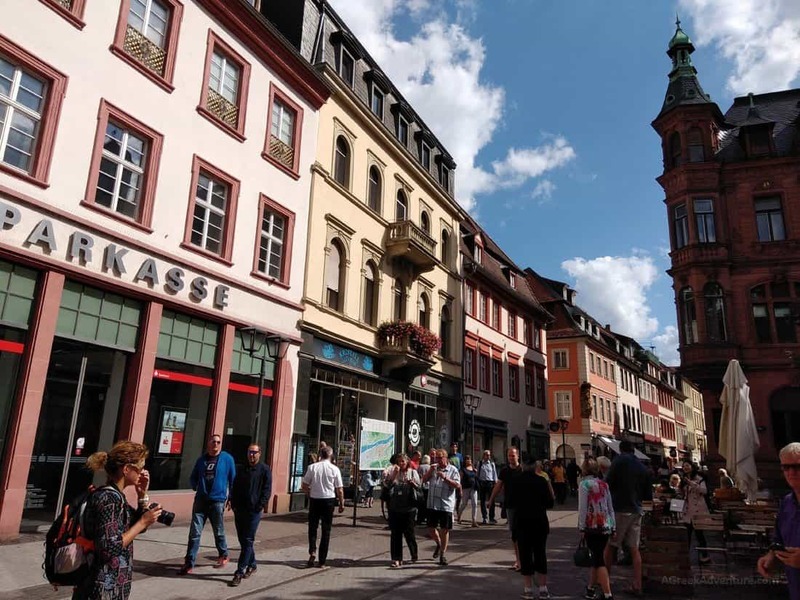 You can combine a weekend in Heidelberg along with another city as part of a longer trip or -even better- as part of a road trip through Germany. The historical center occupies an area you can explore in a couple of days, in detail. We went to Heidelberg near the end of August so weather was slightly cool, not too warm. Clouds were coming and going and in some places a light jacket was necessary. 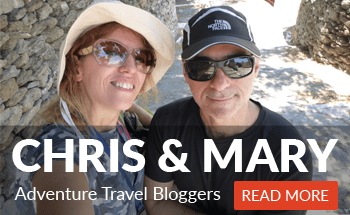 A few days ago we were spending a week in Ios island, Greece where it was really hot. Talking about a huge difference! Here is our itinerary, which also left us plenty of time for relaxing too. 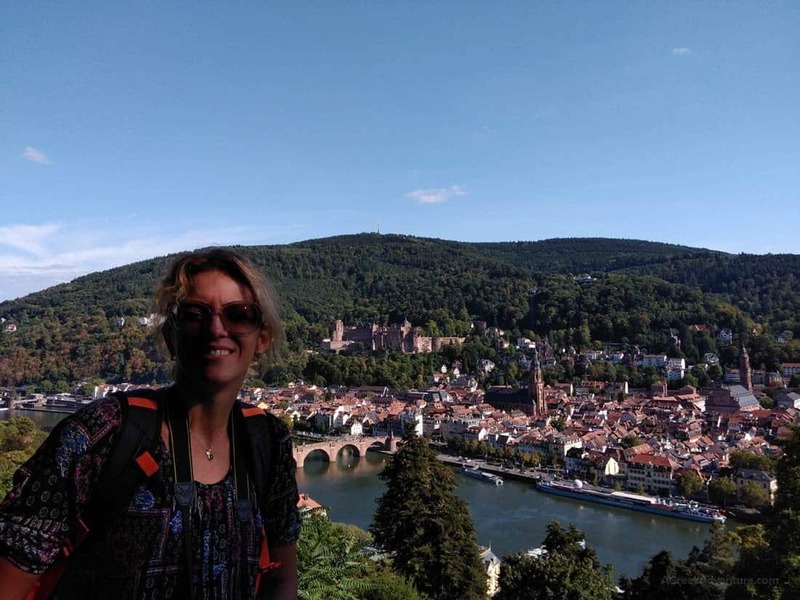 One of the must-do things in Heidelberg is to visit the place for which is mainly famous for. That is, the Heidelberg Castle (Heidelberger Schloss). It is one of the most important Renaissance structures, north of the Alps. You can easily spend 4 to 5 hours (maybe more) there, since the castle complex hosts a variety of museums and open areas. A big part of the castle ruins was an extended castle that the king offered as a present to his queen. You know… like “here darling, I have a “surprise” for you; it is a castle to be ready in a couple of years”. Early present spoiler! Anyway, the castle is built on the top of the hill and occupies a really big area. You have 2 options to get there. Either with the funicular or walking. Entrance fee is the same either way, so just take the road uphill only if you want to walk. Hiking up the hill, involves a lot of stairs too, something you can skip with the funicular. Entrance fee was 7 euro p.p. Make sure to allow time to just relax at the terrace and gardens. There are small stores selling ice cream and snacks. The view from the terrace is spectacular. That is a really big and well structured museum related to the history of pharmacy in Germany. You can be more than 1 hour in there. 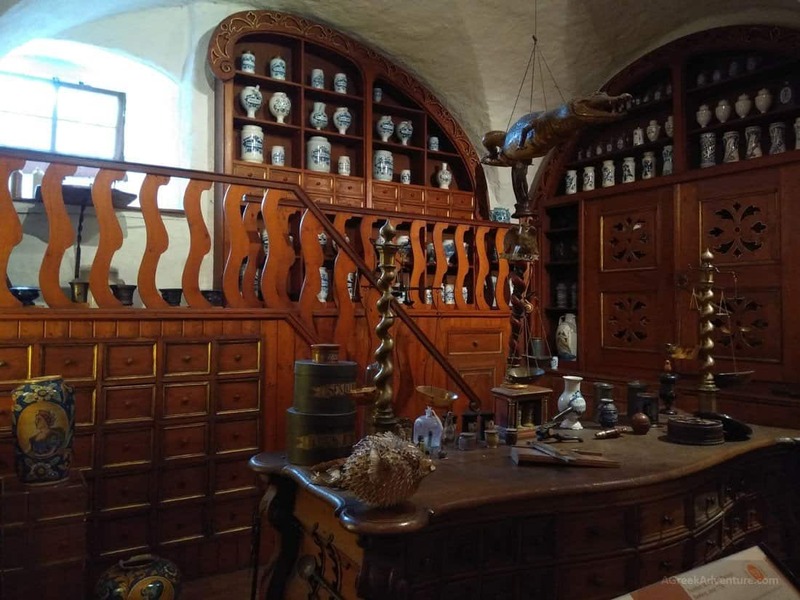 You will see some great visuals that explain the history of pharmacy, from ancient years, going though alchemists up until the form it has today. Old pharmacist store. Notice the alligator at top right. That is not all. There are complete apothecary setups, all the tools, lots and lots of herbs and all kinds of natural products that were used to produce ointments, tinctures and powders. 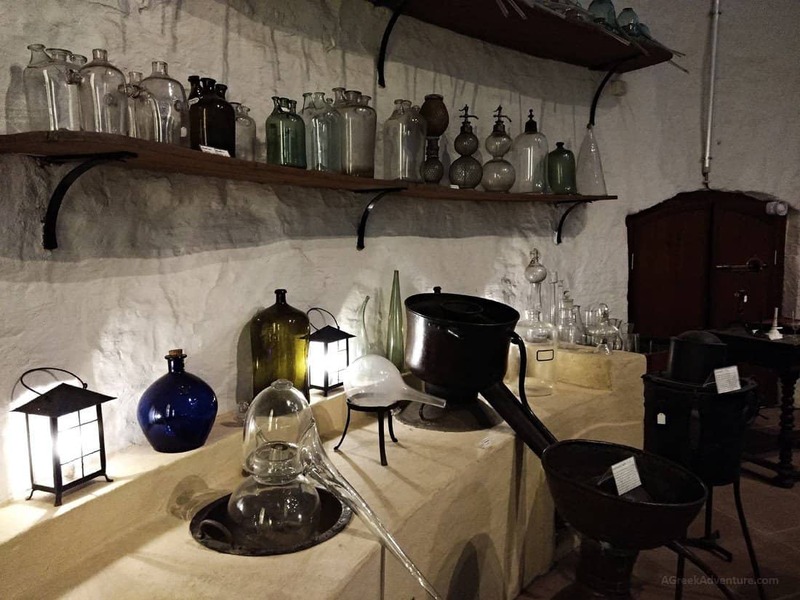 At an underground level you will visit the apothecary laboratory with all the cauldrons and distillers and tools. It will remind you an alchemist’s secret den, as seen in movies. But it is true! This whole place shows how medicines were produced. 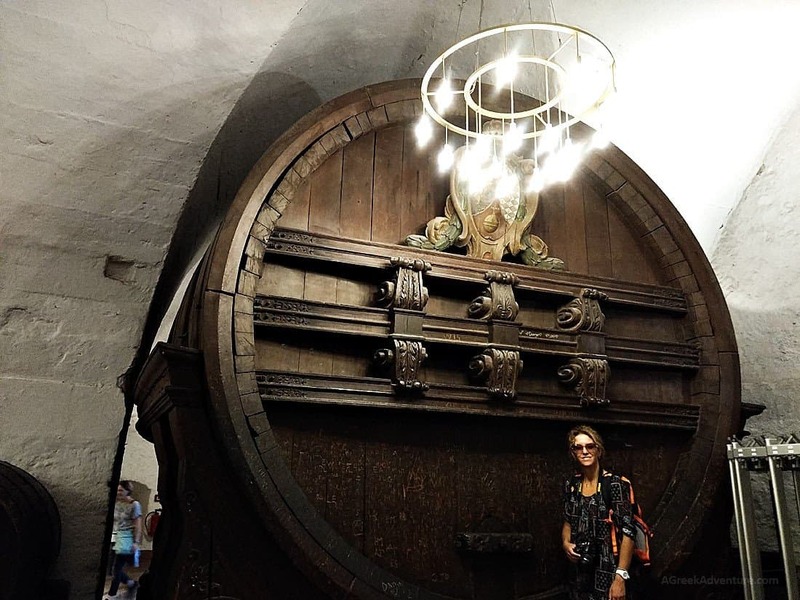 The Great Heidelberg Tun, is indeed a huge wine barrel. I mean, it is really huge. You can stand next to it or on top of it and feel really small. Its current capacity is 219,000 litres (57,854 U.S. gallons)!!! These people got in some serious work and trouble to store their wine. There were 4 such barrels in the history of Heidelberg. This one is the Karl-Theodor-Fass (1751). The other three are Johann-Casimir-Fass (1591), Karl-Ludwig-Fass (1664), Karl-Philipp-Fass (1728). Get next to it and take a nice photo with a big smile! 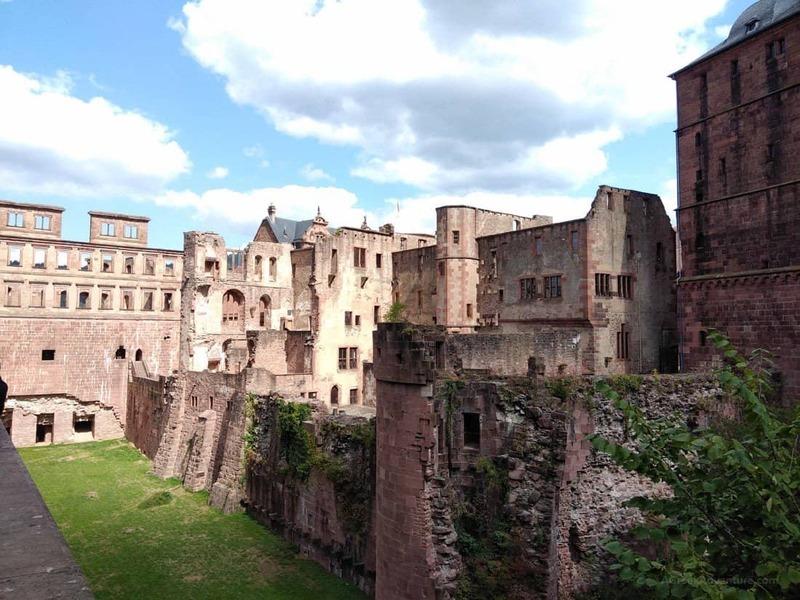 There are different spots while in Heidelberg castle courtyard from where you can enjoy the view to the city, but the major one is the big terrace at the back. Talking about a really big one, where you feel the greatness of this place. Just sit there and enjoy the view. Many will do the same. Heidelberg University is really popular for many years now. It was founded in 1386; the third university established in the Holy Roman Empire. It is one of the most prestigious in the world. 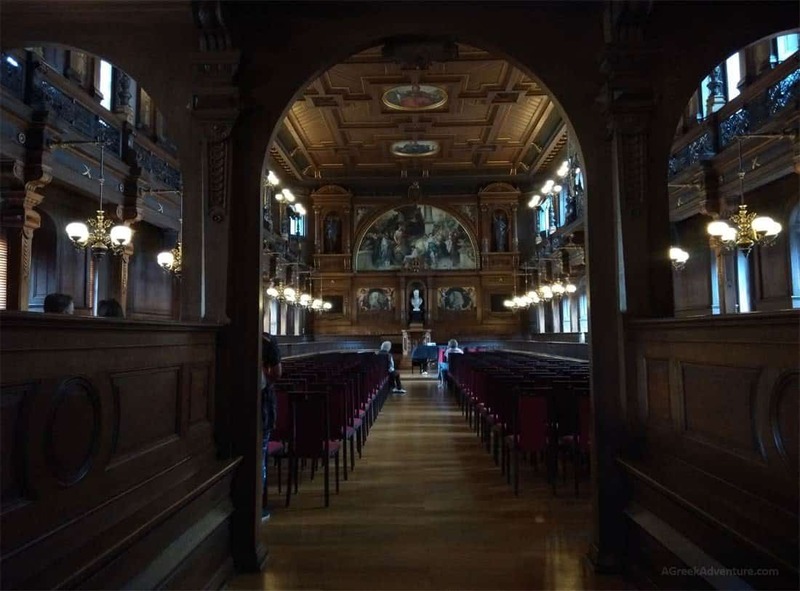 You need to get into the old Lecture Hall of the university, all covered with paintings and that dark wood. The hall beams knowledge and wisdom. There is an additional museum in the university showcasing instruments and books related to the early discoveries on science. It is located at the Universitats Platz. 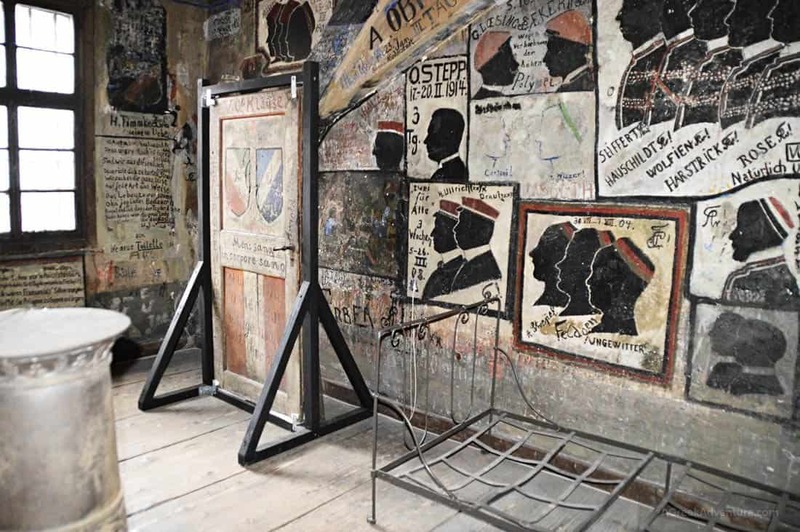 Entrance fee is at 3 euro and includes admission to: the Students Prison, University Museum and Great Hall. Now that is a rather interesting thing to visit. It is indeed a prison (Studentenkarzer) for students who misbehaved. The word prison may sound dreadful enough but for students this was a kind of ritual to be “hosted” there. “Prison time” was from 3 days to 4 weeks. 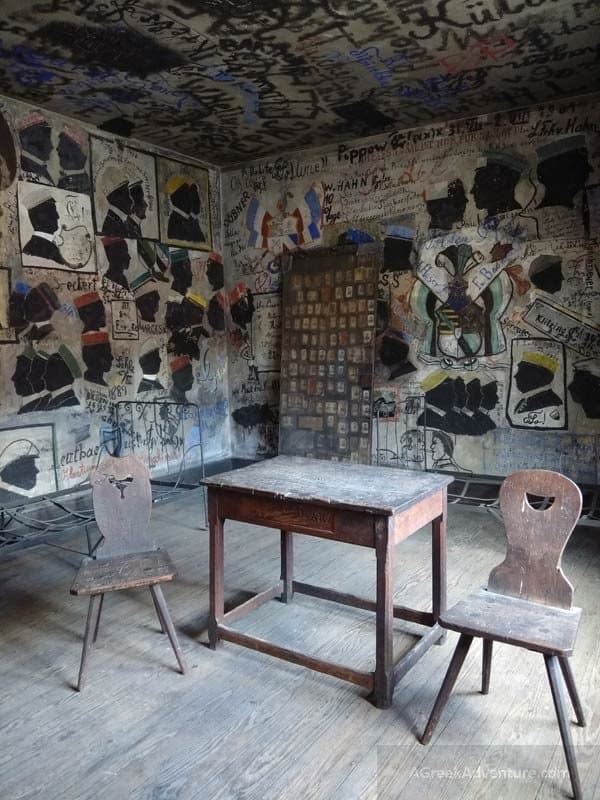 There are students graffiti literally everywhere in the prison; roofs, tables, walls, floors, you name it. Every bit of surface is covered with words. A student would get some time in there for reasons like: disturbing the peace, womanising, heavy drunkenness, & setting the townspeople’s ubiquitous pigs free. Well, it seems this was their way of pointing out the “all work and no play”, with lots of… play. 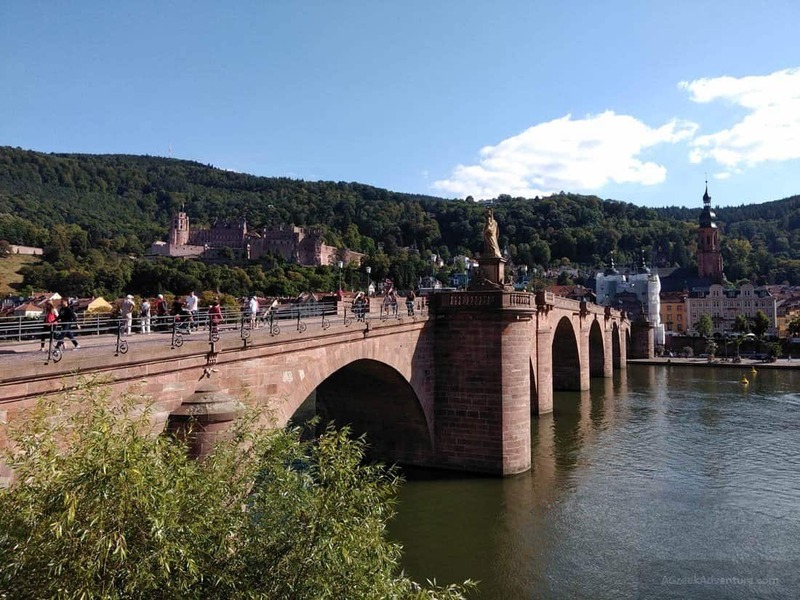 Getting down from the castle, using the really nice path behind the castle (and not the funicular), you will end up a few meters away from the beautiful old bridge of Heidelberg (Karl Theodor Bridge), also known as Alte Brücke (Old Bridge). It’s not that big but it connects the Old City with the eastern part of the Neuenheim district of the city on the opposite bank. It is nice to walk it through and admire the statues. The two sculptures groups on the bridge are by Konrad Linck. One is a monument to Prince Elector Carl Theodor. He had the bridge built. The other is devoted to the Greek goddess Minerva (Pallas Athene). The Prince Elector was a passionate supporter of arts & sciences. That is the reason a monument to the goddess of wisdom was erected there. Since you just walked through the bridge, you are happy to know that the Philosophers Way (route) is close to the point you are. You are also at the “rich” area of Heidelberg. You will understand this by the type of old aristocratic houses. Just spot the small sign that says so, that leads through a narrow (but long) uphill stone-paved path to a circular route. Now you are in the philosophers path. That path before reaching the Philosophers one is called Schlangenweg (Winding Path). It will take some of your breath away, mostly due to all the uphill walking. Look out for the hidden spots along this one where you can sit on a bench and admire the city view. At the end of the Schlangenweg (Winding Path) you end up on an asphalt road. That is the (Philosophenweg). What is this Philosophenweg about? 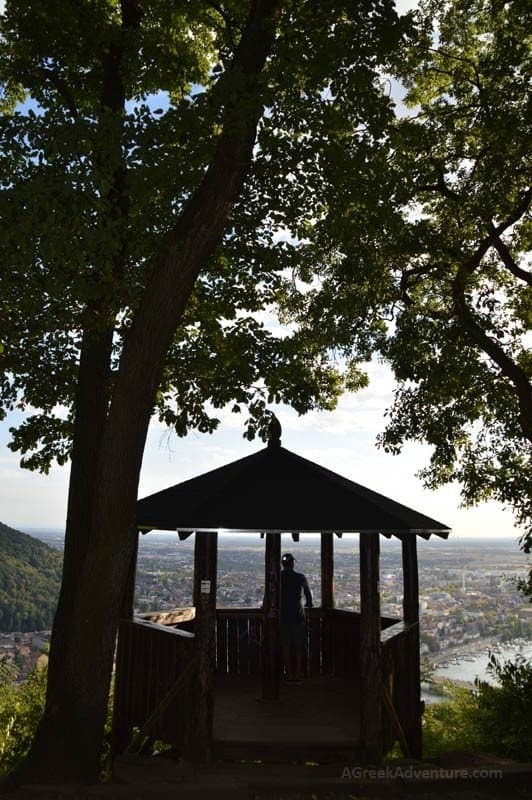 “…Heidelberg’s university professors & philosophers found this path a congenial place where they could talk seriously and contemplate while enjoying the charming view of the Neckar…”. That is exactly as described and is indeed very beautiful. Take some water with you as there are no places to get any, except one kiosk near a crossroad that gets you higher in the Heiligenberg Hill and another coffee house near the top of the hill (which is far). 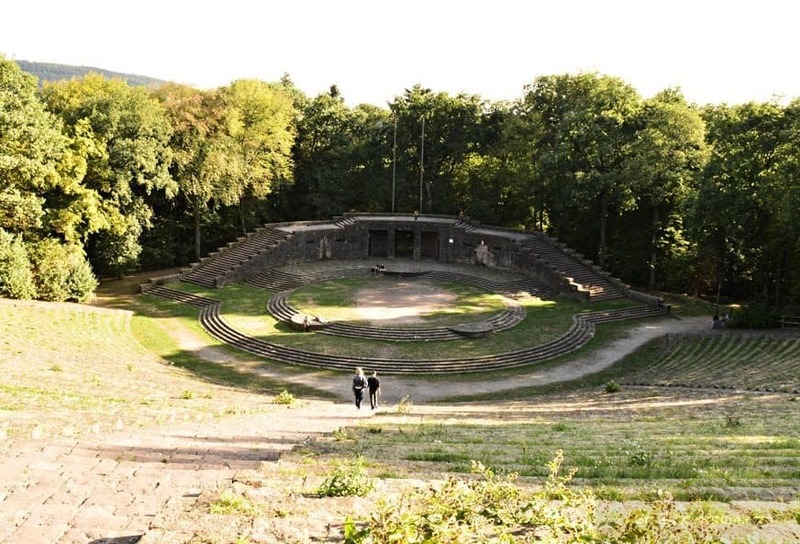 This route is a very nice promenade route but if you want to get deeper in the hill forest and examine some ancient ruins and an ancient theater then you need to go up… and deep. We suggest to take the signs towards the Heiligenber Hill. That is a very nice one, almost all done in asphalt road but through the forest. Along your way there are small castle towers, a well that mentions that it connects underground with a castle, an old monastery and an ancient theater. We did all the route up to the hill top where the monastery ruins are. A very pleasant hiking, through this -absolutely- quite German forest. No birds were singing, just quietness. There are many hiking routes starting from various points of the hill. 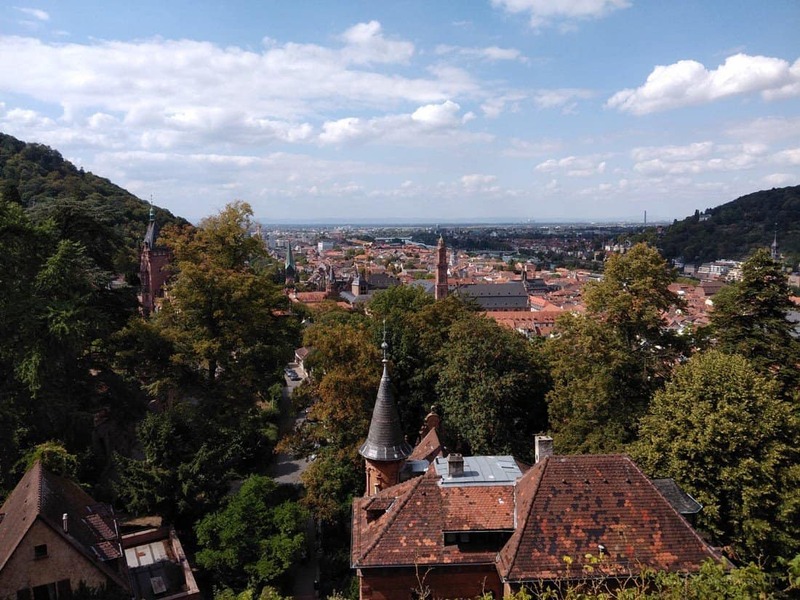 Some end up at the castle, while others go around the hill and in the city of Heidelberg. Make sure you have enough time before getting dark. Take a slow long walk in the old city. 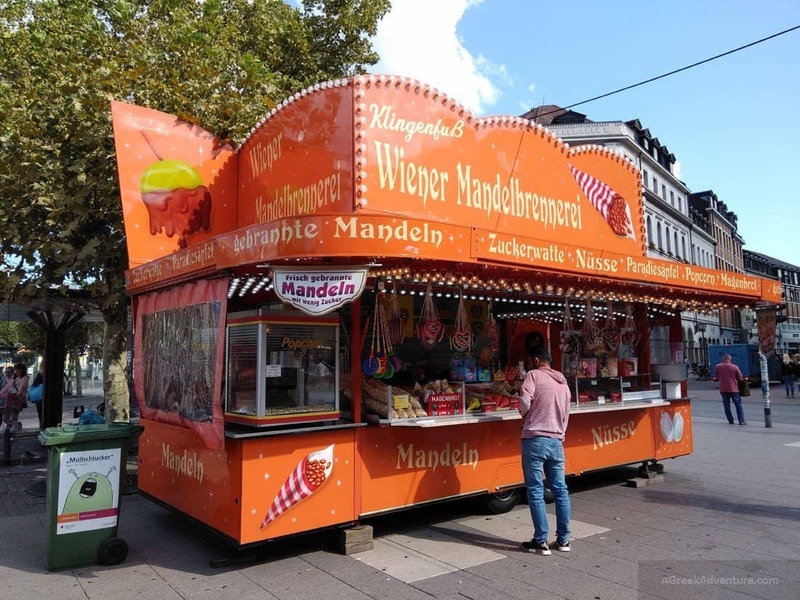 Taste some traditional sausage from the kiosks or some chocolate sweets. Drink beers in any of the many restaurants. Note that most of them are closer to the castle area, than to the old city entrance. We had some serious sausage and cabbage plate in one of them. There are stores for all kinds of touristy things in the old city and you can enjoy the city architecture as you walk. Everyone was eating ice-cream! I mean, whow! Most restaurants serve Italian food, not local food. You can get the flight to Frankfurt and then take the train to Heidelberg. Train takes around 1.30 hours to get there, or drive with your car if you are in the country. Train ticket cost is 20 euro p.p. from Frankfurt Flughafen Regionalbf (airport). If you want to definitely have a seat in the train it is better to book a business ticket. More or less, the same concept stands from any other place in Germany towards Heidelberg. Try to locate a traditional German food restaurant. We were eager for such as we love (well, I -Chris- for sure) German sausages, pretzels and sour cabbage. Who would imagine that it was so difficult to find a variety of such traditional restaurants. Most were serving Italian food, along with some German food. We recommend the Palmbrau Gasse (Hauptstr. 185, 69117 Heidelberg). There is also a bar next to it with the same name. Very nice one with large wooden tables, lots of people and decent plates. 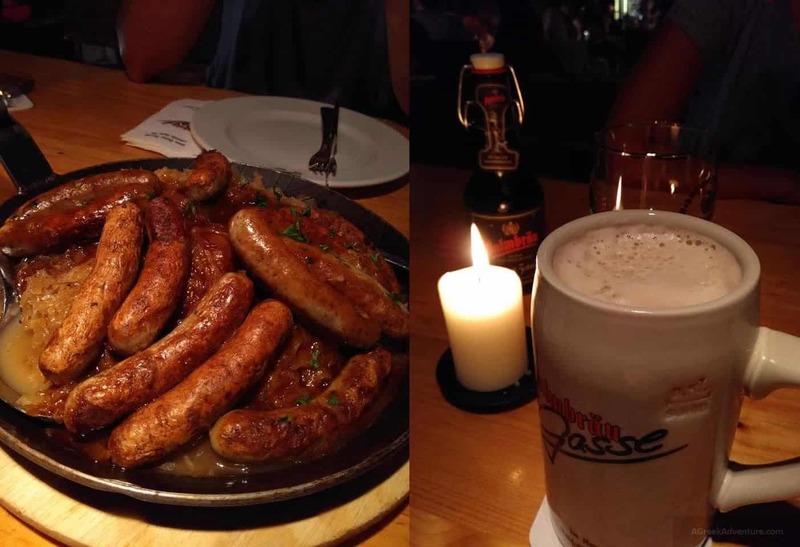 Really liked the black beer and the sausages. Cabbage was fine but maybe way too much in the plate. We noticed that many were eating plates of pork shank too which is a classic for beer restaurants. Maybe we try that next time. We stayed in a modern hotel near the main train station. The old city was in a 20 minutes walking from there, but you could also take the bus just outside the hotel. We usually prefer to walk a lot. We stayed at: Star Inn Hotel & Suites Premium Heidelberg, by Quality. Big clean modern rooms, minimal design everywhere, excellent complimentary coffee. Breakfast was really big and good with lots of healthy varieties. Most of the weekend visitors were Germans and Italians! Our visit was in late August and it was a bit cold. We had a light jacket all day long. When sun was striking out it was a bit warmer but not really hot, if you know what I mean. You will notice the clouds in our photos. However, when swimming in sea is not an option we like this kind of weather as it is perfect for walking and hiking around. Here are the weather details for Heidelberg. Summer (June to August): You can encounter unpredictable weather ranging from 20 to 30°C. Most tourists come during this period. Winter (December to February): Can get really low (3-5°C). Spring (March to May) and Autumn (September to November): Temperatures around 10 to 14°C. Chill but nice. Definitely a city for a weekend. That is why many Germans visit this place during weekends. You have lots of things to do for 2 days and the things we mention are the best to experience. When you do, share your findings with us! Always keep in mind to travel safely. Don’t neglect your travel insurance.